Toffee flavoured popcorn with cocoa, covered in Belgian milk chocolate. 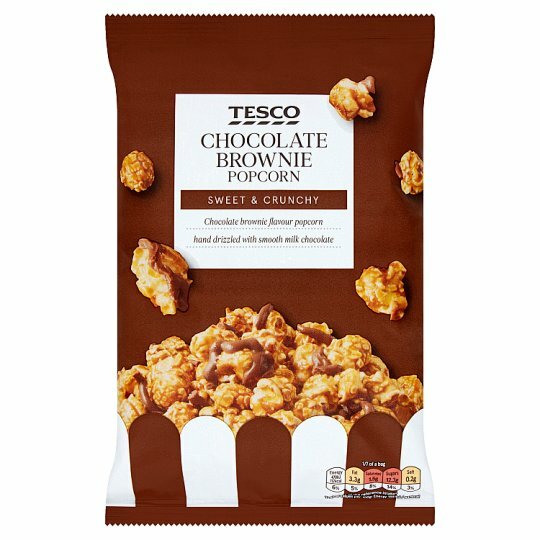 SWEET & CRUNCHY Chocolate brownie flavour popcorn hand drizzled with smooth milk chocolate. When you're making popcorn, there are two main types of corn kernels to choose from: mushroom and butterfly. For this popcorn we choose only the best mushroom kernels. Their rounded shape means they get a nice even coating, so every bite is bursting with flavour. Glucose Syrup, Sugar, Belgian Milk Chocolate (20%), Maize, Butter (Milk), Rapeseed Oil, Salt, Cocoa Powder, Flavouring, Emulsifier (Soya Lecithins). Belgian Milk Chocolate contains: Sugar, Dried Whole Milk, Cocoa Butter, Cocoa Mass, Emulsifier (Soya Lecithins), Flavouring. Milk Chocolate contains: Cocoa solids 32% minimum, Milk solids 22% minimum. This product may contain unpopped maize kernels.